The purple finch is one of hundreds of North American birds that due to rising temperatures are spending their winters farther north than they did forty years ago. When it comes to global warming, the canary in the coal mine isn't a canary at all. 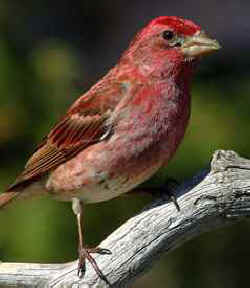 It's a purple finch. As the temperature across the U.S. has gotten warmer, the purple finch has been spending its winters more than 400 miles farther north than it used to. An Audubon Society study released Tuesday found that more than half of 305 birds species in North America, a hodgepodge that includes robins, gulls, chickadees and owls, are spending the winter about 35 miles farther north than they did 40 years ago. The purple finch was the biggest northward mover. Its wintering grounds are now more along the latitude of Milwaukee, Wis., instead of Springfield, Mo. Bird ranges can expand and shift for many reasons, among them urban sprawl, deforestation and the supplemental diet provided by backyard feeders. But researchers say the only explanation for why so many birds over such a broad area are wintering in more northern locales is global warming. Over the 40 years covered by the study, the average January temperature in the United States climbed by about 5 degrees Fahrenheit. That warming was most pronounced in northern states, which have already recorded an influx of more southern species and could see some northern species retreat into Canada as ranges shift. "This is as close as science at this scale gets to proof," said Greg Butcher, the lead scientist on the study and the director of bird conservation at the Audubon Society. "It is not what each of these individual birds did. It is the wide diversity of birds that suggests it has something to do with temperature, rather than ecology." The study provides compelling evidence for what many birders across the country have long recognized - that many birds are responding to climate change by shifting farther north. Previous studies of breeding birds in Great Britain and the eastern U.S. have detected similar trends. But the Audubon study covers a broader area and includes many more species. The study of migration habits from 1966 through 2005 found about one-fourth of the species have moved farther south. But the number moving northward - 177 species - is twice that. The study "shows a very, very large fraction of the wintering birds are shifting" northward, said Terry Root, a biologist at Stanford University. "We don't know for a fact that it is warming. But when one keeps finding the same thing over and over ... we know it is not just a figment of our imagination." The research is based on data collected during the Audubon Society's Christmas Bird Count in early winter. At that time of year, temperature is the primary driver for where birds go and whether they live or die. To survive the cold, birds need to eat enough during the day to have the energy needed to shiver throughout the night. Milder winters mean the birds don't need to expend as much energy shivering, and can get by eating less food in the day. General biology aside, the research can't explain why particular species are moving. That's because changes in temperature affect different birds in different ways. Some birds will expand their range farther north. For example, the Carolina wren - the state bird of South Carolina - has turned into a Yankee, based on Audubon's calculations. It is now commonly seen in the winter well into New England, as well as its namesake state of South Carolina. "Twenty years ago, I remember people driving hours to see the one Carolina wren in the state," said Jeff Wells, an ornithologist based in southern Maine. "Now, every year I get two or three just in my area," he said. "Obviously, things have changed." Other species, such as the purple finch and boreal chickadee, spend their summers in the forests of Canada and fly south into the U.S. for the winter. Climate change could be playing a role in why they are not flying as far south as they used to, and are no longer as common as they were in states like Maine, Vermont and Wisconsin. For other species, global warming may not be a major factor in the movements measured by Audubon at all. The wild turkey was second only to the purple finch in miles moved north - about 400. But it's likely due to efforts by hunters and state wildlife managers to boost its population. In other cases, the range shifts are prompting calls to cull some bird populations. The sandhill crane, a large gray bird that migrates to the southern U.S. for the winter, has a range that expanded about 40 miles north in the last 40 years. This small movement has likely contributed to the bird's population explosion in Tennessee. The sandhill population has grown to a point that state wildlife officials are considering allowing the bird to be hunted. "You are seeing it all across the state," said Richard Connors, president of the Tennessee Ornithological Society. "As it increases, there is going to be pressure to hunt it. The bird watchers of Tennessee don't want that."